Those words of wisdom are echoed from the heart of the dynamic trendsetter, Deborah Clemons, Founder/CEO of Infusion Blends Spice Infused Artisan Butters. Infusion Blends provides a delectable collection of spice and fruit infused artisan butters made with all natural and organic ingredients. Just the name of her products makes your mouth water: “Cajun Delight”, “Amazing Rosemary”, “Perfectly Peachy”, “Oh My Blueberry”; and, coming soon, “Apple Sin Oh Man” and “Beautiful Bourbon”. Infusion Blends has turned Deborah's hobby into a flourishing business. Her success has enabled her butters to be sold at various gourmet and farmers markets throughout Georgia, Florida and Tennessee and her online store, infusionblends.com. Infusion Blends may soon be found on the shelves at Kroger Supermarkets. Deborah is currently negotiating with Kroger to have the butters on the shelves of several National Super Market Chains. 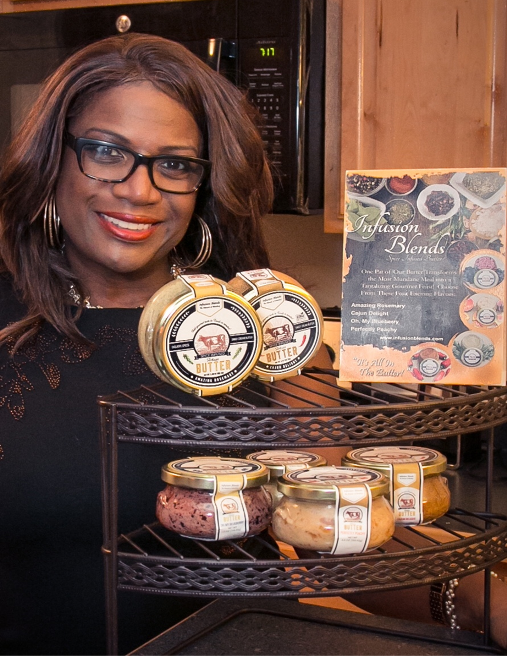 “I was once told to “Just Do It’; and, once I realized that others were also excited about my flavored butters, it didn’t take long before I decided to go ahead and market my products,” expressed Deborah. As a spin off to the Infusion Butter concept, Deborah has partnered with a new powerful media giant, Virtual Eminence to create an On Demand food television network called “Infusion Network”. Infusion Network will be a food lifestyle channel with entertaining shows focused on food. Deborah is taking food to another level. From cooking shows, health and fitness, entertainment and travel, food is infused in all of it. As a result, Infusion Network is being launched to give viewers world-wide an opportunity to experience a food lifestyle through television like never before. Slated to launch during the first quarter of 2018, Infusion Network will reach more than 200 million homes world-wide and offer unlimited access through Roku, Amazon Fire TV, Android TV, Apple TV, Smart TV, Sony Play Station, Direct-to-Netflix, The Orchard, and numerous other digital media applications and platforms. Because of Deborah’s electrifying personality and great vision, she has garnered the support from former NFL Player and CEO of Official Pro Players, Mr. Walt Harris. Mr. Harris will come aboard as a Partner with the Infusion Network. He will not only be an active Partner in the company but will also have his own show “The Real Walt Harris Tailgate Party”. Deborah has a wealthy background and an array of professional experience. Among many positions, she served as National Director of Retail Services, Tommy Hilfiger USA, New York, NY. Tommy Jeans” division. While working with Tommy Hilfiger, she executed high-level decision-making authority in administering a $5 million annual budget and enjoyed an increase in staffing from 100 members to nearly 2,000 selling specialist in major retail chains across the country. Deborah not only displays a flair for flavor, she believes strongly in helping others. She also volunteers at the Fulton Schools College and Career Academy teaching students how to become food manufactures. Deborah said, “For the most part we teach students skills in the service side of the Food Service Industry. I bring different options to students by teaching them to take paths to become food manufacturers.” Deborah continued, “The students learn how to take food products from concept to the consumer. At the end of the course, students are able to follow career paths to become independent entrepreneurs or manufactures for other companies,” concluded Deborah. Deborah stated that she learned at an early age that food was infused in every aspect of life. She said, “My childhood was extremely fun. I grew up with my mom, dad and my sister Donna and a host of Aunts, Uncles, Cousins and friends. It seemed as if food was always in the center. We constantly came together to enjoy one another while also enjoying big family meals. Food not only feeds our body it fuels our soul, sprit and mind to do what we were put on this earth to do. Fellowship through food creates an environment to bring people together and keep us together,” expounded Deborah.